We highly recommend a Cabo Sunset Dinner Cruise to each and every guest, because each cruise is completely unique as aquatic life and sunsets never repeat themselves. If you do not experience the Land’s End Tour with a Cabo Sunset Dinner Cruise, then simply put…you have not experienced Cabo San Lucas. Enjoy the beauty of the Sea of Cortez aboard an extremely capable, new vessel as the sun sets. 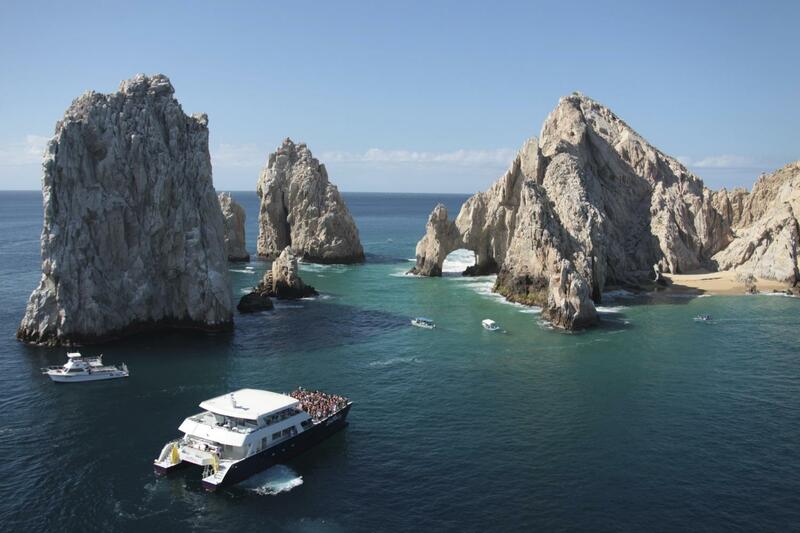 During dinner cruises in Los Cabos, you will seemingly soar around the tip of the peninsula. This trip includes an abundance of picture-taking opportunities of the pelican colony, sea lions and, especially, encounters with the Mystical Arch. All of our Cabo Sunset Dinner Cruises offer a very quiet yet fun environment with ample and comfortable seating. Throughout, guests will experience 5-star service standards and food quality with an impeccable full-service boat accompanied by restrooms. What’s more, during this fantastic and memorable experience, guests will enjoy fun music and a scrumptious dinner prepared right on the deck. Tropical drinks are served by our ever-friendly crewmembers! Amazingly beautiful views and the captain pointed out whale sighing so everyone could get great pictures.